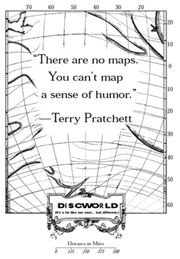 I’m sad to say that Terry Pratchett, who has transported me to the wonderful Disc World (which flies through space on some elephants and the great space Turtle A’tuan) and kept me in laughter and silly giggles for more than a decade, has announced that he has a rare form of early Alzheimer’s disease. I’m bummed. I’ve read most of the Disc World series and always look forward to his next book filled with his unique imagination and British wit. Of course, as he says in the article linked above, he isn’t dead yet and will be able to give a few more delightful romps through Disc World before he can no longer do so.